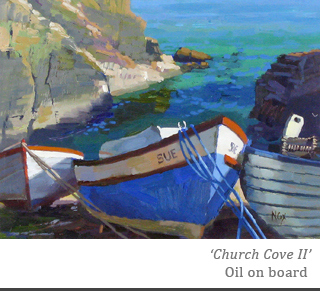 In our upcoming Spring Exhibition, we will be showing new paintings by Neville Cox, a Watchet based artist who is a regular exhibitor at Churchgate Gallery Porlock. We visited Neville in his studio to find out more about his painting process. 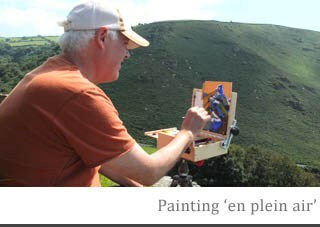 For Neville painting has been a lifelong interest, but since retiring from his day job he has been spurred on to dedicate himself to painting full time. Having time to experiment with different subjects and media has allowed him to develop a distinctive style, which continuously evolves and develops. 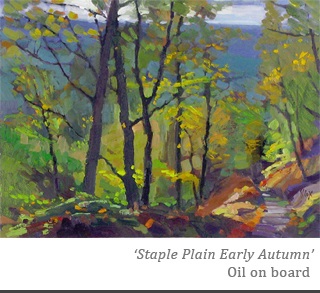 The artists who have had the most influence on Neville as a painter are those who have also worked outdoors, such as Trevor Chamberlin and David Curtis. Certain places can also be mines of inspiration, with the dramatic topography of the Valley of the Rocks near Lynton in Devon having an enduring appeal. 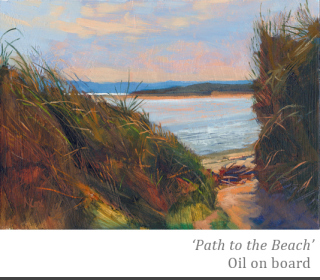 Neville’s work is constantly evolving, with his most recent series of paintings being inspired by Cornwall, and the unique colour and light and coastal villages that can be found there. 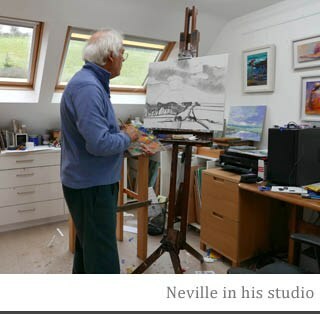 Despite sometimes experimenting in different media and techniques including acrylic, pastel and mixed media, the versatility of oil paint is something Neville always returns to.